Translation of “MÚOSZ: Government independent media could further narrow” published by hirtv.hu. Magyar Nemzet appeared for the last time on Wednesday. Lánchíd Rádió went silent Tuesday at midnight. The president of the Hungarian Journalists Countrywide Association (MÚOSZ) expects a further narrowing of the free press after the Fidesz two-thirds parliamentary victory on April 8. The experts say that Fidesz can employ numerous techniques to silence critical voices. Lánchíd Rádió closed after 11 years due to financial difficulties. 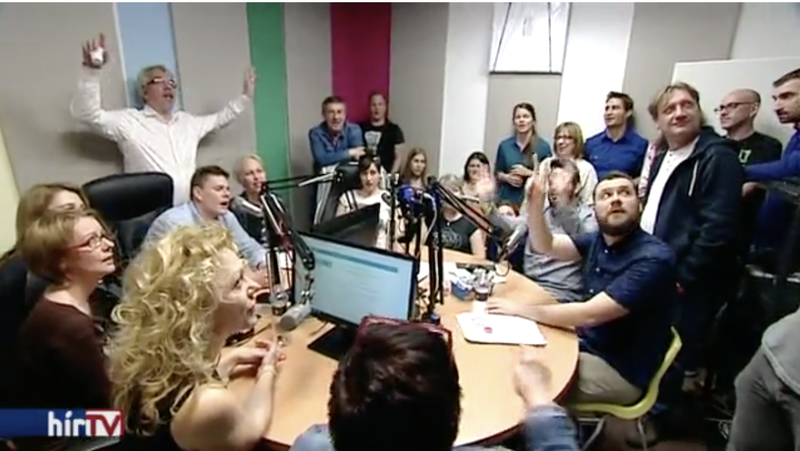 For similar reasons Lajos Simicska closed another media enterprise: Magyar Nemzet appeared for the last time on Wednesday. The 80-year-old paper survived the German invasion and the revolution of 1956, but not the new Fidesz two-thirds majority. People working there are confident that this is not the end. In the farewell edition they wrote: they believe democracy and impartial reporting still exists in Hungary and hope that they will return. During the campaign the prime minister frequently stated in no uncertain terms that the critical media does not expect much good to come from a new Fidesz victory. Tuesday, in response to questions from Index, German-owned television channel RTL Klub and 24.hu publisher Central Media Group stated that they will continue. Index is not planning any changes. Media researchers believe, however, that through certain economic actions, the government may further narrow the government-independent press. State advertising expenditures will be further concentrated, perhaps the level of the advertising tax will be raised. Following the example of 444.hu, after the elections hvg.hu also launched a fundraising drive: they are asking support for their operations from their readers. An expert believes, however, that with a two-thirds majority the government can take direct steps to make it impossible for editorial staffs to do their work. In recent years Hungarian media outlets have fallen one after the other into the hands of those close to the government: every county newspaper, Origo, Bors, Figyelő, TV2 and Echo TV has been taken over by businessmen close to Fidesz. The media researcher thinks that 60-70 percent of organs providing public content are influenced by the government. “State of independent media in Hungary uncertain after the election” writes liberal Austrian newspaper Der Standard in a lengthy article. The newspaper emphasizes that in recent years numerous media in the country became pro-government.